The song “From little things big things grow” so aptly describes the relationship between krill and blue whales, as it is one of the smaller organisms on the planet that sustains the life of the very largest. Krill could certainly do without all the hungry predators (including humans) that gulp them up in great quantities, however without krill on the menu, species like blue whales would not survive. So what are krill and why are they so important in the marine environment? To answer this, we need to take a step back. Plankton are the ocean’s drifters; the word plankton is derived from the Greek planktos which means ‘drifters’. Plankton is comprised of microscopic plant-like cells called phytoplankton, and tiny animals called zooplankton. These tiny organisms ‘float freely in the sunlit surface of the sea, where they underpin the marine food chain, provide the world with oxygen, and through their birth, growth, death and decay, play an essential role in the global carbon cycle’ (Kirby, 2010). Without plankton, the oceans would be barren!! Zooplankton, to which krill belong, eat either phytoplankton or smaller zooplankton. Krill, shrimp-like crustaceans of the family Euphausiidae, are filter-feeders that comb microalgae and smaller zooplankton from the water. However, despite the definition of plankton as ‘drifters’, krill are actively-swimming animals, constantly searching for optimal foraging conditions, while attempting to avoid prey. They frequently migrate vertically to exploit the habits of their prey, to avoid predators, or to enter currents moving in favourable directions at different depths. They are known for their swarming habit, whereby millions or billions of individuals can aggregate and move as a single co-ordinated super-organism. This tendency to swarm, which may increase the chances of survival of each individual krill, makes them attractive to predators such as baleen whales. There are about 85 species of krill worldwide, ranging from polar to equatorial waters. The best known and largest (40mm) species is Antarctic krill, Euphausia superba. They swarm in vast numbers and previously supported the huge numbers of baleen whales that inhabited Antarctic seas prior to 20th century whaling, as well as numerous species of seabirds, seals, penguins and fish. 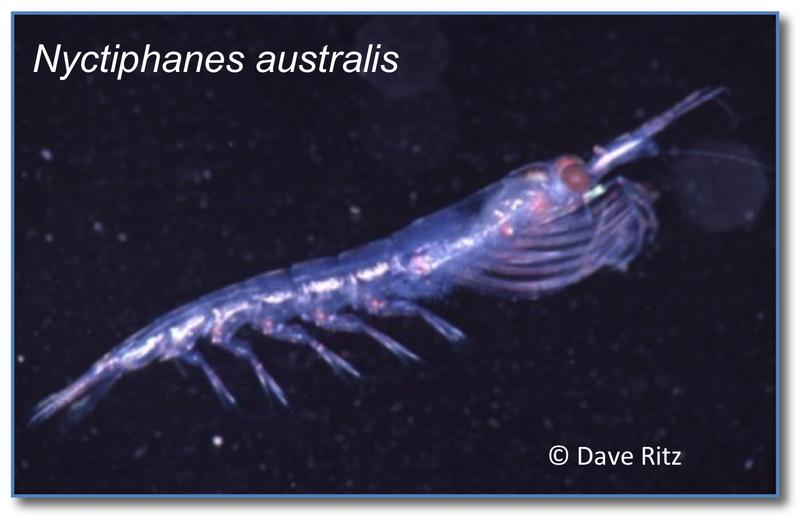 The species of greatest interest to the Blue Whale Study is Nyctiphanes australis, the ‘coastal krill’ of south-east Australia and New Zealand (see photo below). They are prey for pygmy blue whales that gather to feed in the Great Southern Australian Upwelling System, from the Great Australian Bight to Bass Strait, during the summer upwelling season, and are dependent on the seasonal productivity of the upwelling. N. australis is also prey for humpback whales off eastern Tasmania and pygmy blue whales around New Zealand. In the Bonney Upwelling they are directly also preyed on by dolphins, fur seals, petrels including short-tailed shearwaters and fairy prions, albatrosses, baitfish such as redbait, anchovy and sardine, barracouta, bluefin tuna, squid, and a diversity of other species. These predators in turn are preyed on by killer whales and sharks. Reaching about 20mm, N. australis is usually found on the continental shelf, in their preferred temperature range of 12-18°C. Krill generally do not like warm water. Swarms may be as small as a basketball, or they can exceed 2km in length. The larger the swarms, the greater the chance that blue whales will be feeding on them. Swarms are found scattered in areas where phytoplankton and other miniscule prey are most abundant. Pygmy blue whales feed on other krill species in other feeding grounds along their migratory route, including the Perth Canyon (W.A. ), the vast Sub-Tropical Convergence across the south of Australia and west into the Indian Ocean, even vaster sub-Antarctic waters further south, and the sub-equatorial waters of the Indonesian archipelago, where strong currents drive upwelling that supports tropical krill species. Commercial krill fishing in the Southern Ocean harvests krill for animal feed or for human consumption. While currently reported to be sustainable, there is the potential for future overfishing as human populations increase. Already climate change has led to the contraction of winter sea ice (Antarctic krill habitat) resulting in drastically decreasing abundance of krill. This in turn affects the food chain and with it, blue and other whale populations. While krill fishing in the Bonney Upwelling is currently unlikely to occur, this ecosystem is also vulnerable to climate change. If you are interested in learning more about the fascinating world of plankton go to Richard Kirby’s book or various website mentioned below. Kirby, Richard R. (2010) Ocean Drifters – A Secret World Beneath the Waves. Firefly Books Ltd.
Nicol, Steve (2018) The Curious Life of Krill. Island Books.